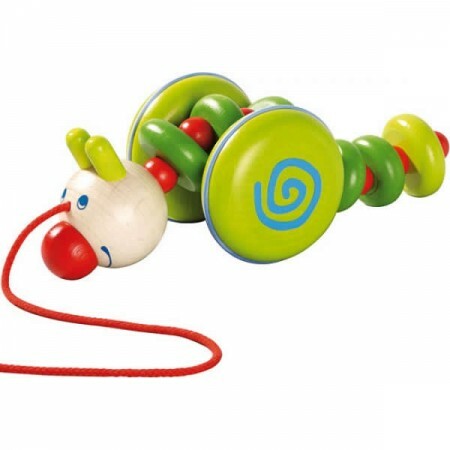 The quality really stands out with this loveable Haba caterpillar toy. Pull him along and his body wriggles up and down just like a real caterpillar does. The body is made from green and red wooden pieces which can move about freely as you pull him along, the wheels have rubber grips and roll nice and smoothly across carpet or hard floors. The way the caterpillar moves when you pull it along is very puppet like and really gives him some personality. This is definitely our favourite pull along toy and would make a lovely gift.